Gather ’round the television, boys and girls! 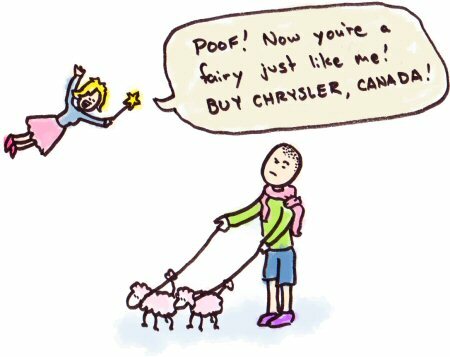 Since “fairy” jokes apparently haven’t gotten old, Chrysler has imported their “too tough” ad to Canada! The ad features a fairy flitting about, waving her magic fairy wand and sprinkling pixie dust on various items she deems to be too tough. A skyscraper turns into a candy-coated gingerbread tower; a city’s mass transit system becomes a toy choo-choo puffing cotton ball steam from its bright green smoke stack, etc. Of course, she’s unable to turn the stocky Dodge Caliber into anything (since it’s just so darn manly) so she accidentally knocks herself into a building where a tough guy calls her a “silly fairy.” Then she turns him gay. Heeheehee, I get it! Oh, Chrysler, you comedians, you! So, there you have it. DaimlerChrysler is shocked—shocked—that a man dressed in pastels, with a sweater knotted about his shoulders, walking several lapdogs with pink leashes would be considered a gay stereotype. They’re equally as stunned to discover that their morning coffee gets cold when it’s left out too long. Look out, Chrysler! The sun rose again today! Eek! A cloud!